Sometimes you have to parse and search through some really large files and this is where bash tools and scripts work best. A little perl script, grep, awk, or sed can help you quickly read a portion of a file, do a search and replace, etc. Since I often code on a Mac, I have covered some simple OSX command-line one liners that I find helpful. But what about managing huge files in the browser? I noticed that Ace Editor can handle a file of few megabytes without any issues in a browser, and it comes with Regex search. It actually works faster on big files that my SublimeText for some strange reason. I have written a few demos on using the HTML5 video tag, showing how you can make screenshots from movies or create animated GIFs, but last night I noticed some major issues with loading a large local video file. It basically crashed my Chrome tab and after looking at my code again, this makes sense. 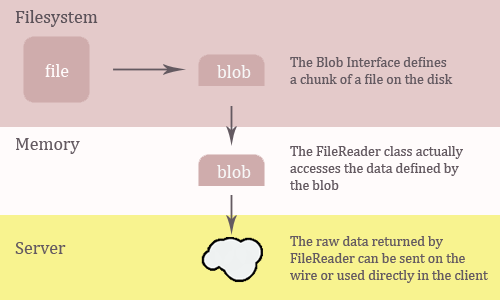 When the user dropped or selected a local video file, I read that entire file using the FileReader API and then created a Blob URL out of it so that it can be used in the HTML5 video tag. But, reading the entire file is not necessary as both the video and audio tag support a file stream.